On October 17, 2012 at approximately 7:44 pm PST, a large fireball entered Earth’s atmosphere over the Pacific Ocean. It was traveling roughly NNE, at a shallow downward angle relative to the Earth’s surface. The bolide was seen over hundreds of square miles by witnesses throughout Northern and Central California. Some witnesses in the Bay Area were lucky enough to hear a series of sonic booms generated by multiple fragments of the meteorite traveling faster than the speed of sound. ABC Local News posted these photos (and more) of the fireball, taken by Bob Moreno. Initial estimates of where meteorites might be found were off by miles due to the lack of doppler radar data and inconsistencies in different video/photo-based trajectories. The final version (as of 11/17/2012) of the estimated fireball trajectory, from Wikipedia. 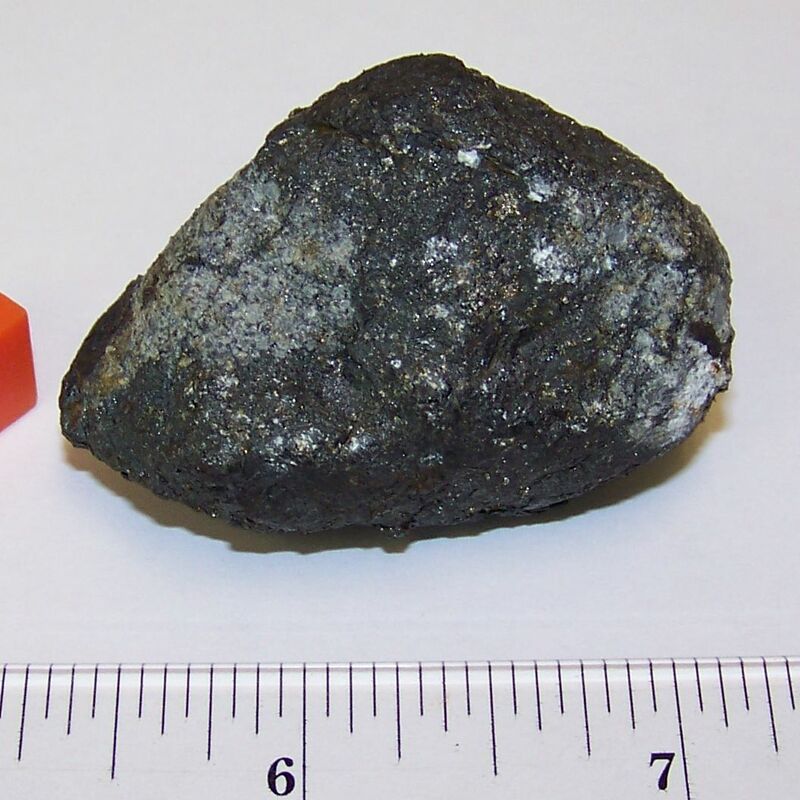 The potential location of meteorites was only narrowed down when Lisa Webber, a local Novato resident, put two and two together after hearing about the path of the recent fireball on the news. The Saturday after the fall, she recalled a noise on her roof that she’d heard a few nights previously. She and her neighbor looked around for the offending rock, and found it in her garden. Novato #1, 61.9 grams. Photo credit is unknown, rights reside with the Novato Patch. We initially hunted with a team of myself, Peter, and Michelle Myers around Bon Tempe Lake, Temelec, and the Southern edge of Novato. We shifted our focus to hunting in the city itself following Lisa Webber’s house-hitting discovery of Novato #1 (and, later, local hunter Brien Cook’s recovery of Novato #2). Novato #2, 65.9 grams. Photo taken by Brien Cook, all rights reserved. 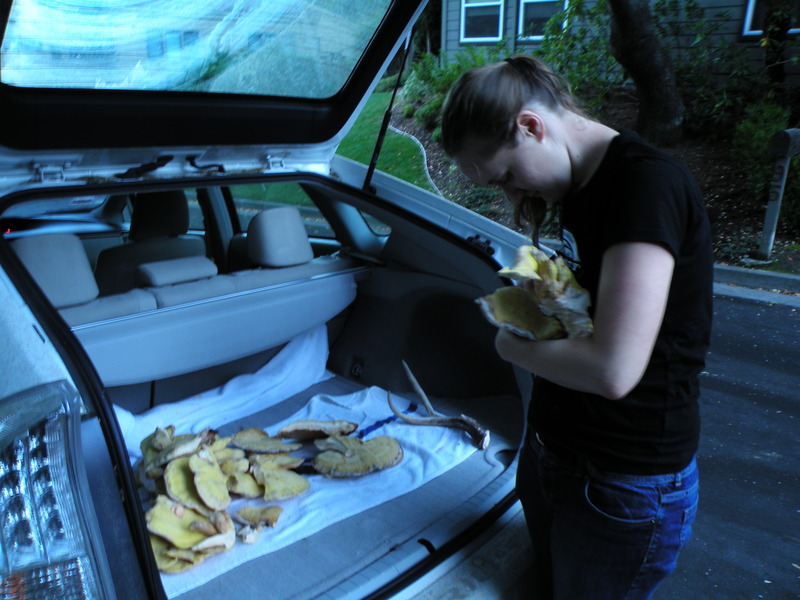 We found some wild sulfur shelves (edible!) on the first weekend, but not much else. I unfortunately had an adverse reaction to them that put me out of sorts for a few days, but Peter and Michelle enjoyed them. They did taste wonderful…the first time around. Michelle guards her catch carefully, having climbed a hollow tree/bee hive to harvest one of the shelves. Ten days after the fall, I was lucky enough to pull off of the 101, only to see an unusually large rock in the middle of the road. The housing development on the far side of the road had gardens edged with golf-ball sized rocks, but they were all confined to the far side of the street. After a few moments’ deliberation, I pulled over, walked back to the rock, and…I’ll let you imagine what it was like to stumble upon what’s in the photos below. Novato, CA. October 27, 2012, 10:56am. Novato #3, 79.0 grams + ~1 gram of fragments. I hunted for the remainder of the weekend with no finds, but I’m not complaining. Time was spent with local collector and hunter Mendy Ouzillou, and we had dinner with another hunter from Southern California. 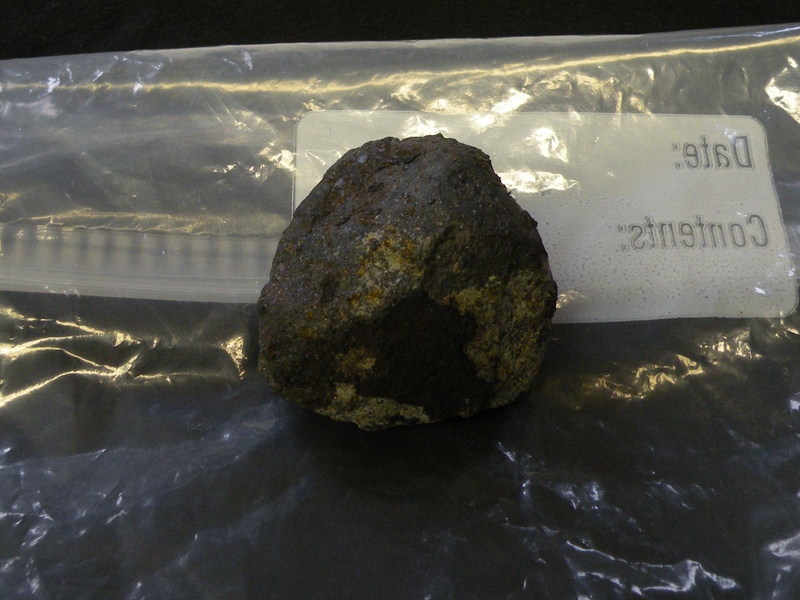 A 96 gram fragment was found later that weekend (Novato #4). The stone was sold to a private collector who lives in the Bay Area. That week, I spent a few late afternoons in the field with no luck, though many roads and fields were searched and/or found to be recently swept or ploughed. The next weekend started as usual, with several hours of walking. While coming down the side of a small residential street, I noticed an odd fragment of rock sitting on the slope of a sidewalk/driveway. Novato, CA. November 2, 2012, ~3:30pm. Novato #5, 24.264 grams in total. The stone is clearly a fresh meteorite, but it looks a little different from the others found. 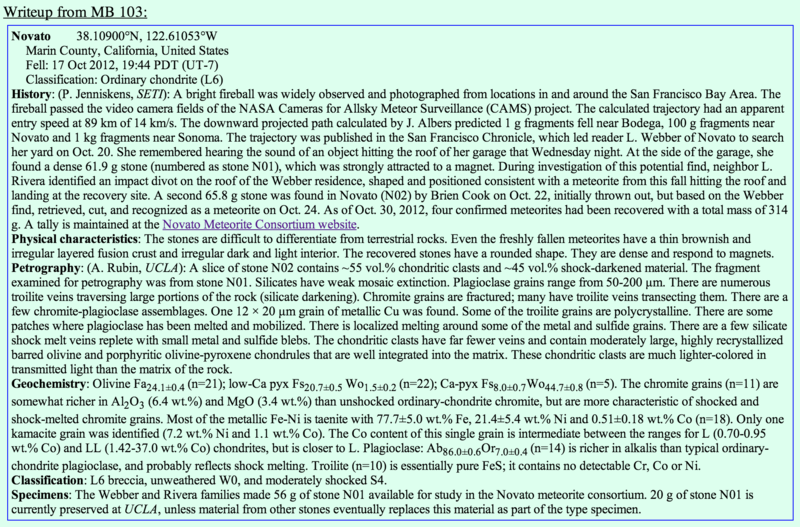 It appears to represent a less-shocked lithology of the Novato meteorite. 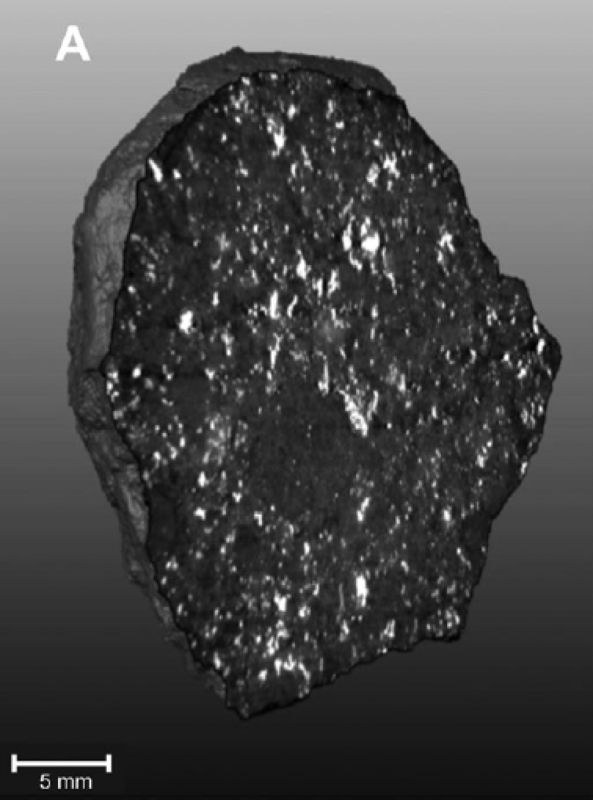 The lighter, unshocked material has retained its fusion crust better than the other four stones found, and exhibits one side of glassy, frothy fusion crust. The larger fragments fit together to make a single thin, sheet-like fragment with fusion crust on one side. I searched the vicinity for over an hour with no luck in finding any larger pieces. All of the fragments found were located in an area approximately ten by twenty feet. One fragment weighing less than one gram was found some ten feet distant, farther into the street, and was likely carried there by a car leaving the driveway. Most of the smaller fragments were recovered from the cracks of the driveway and were obtained with permission from the owners. It appears that one or more larger fragments were repeatedly driven over, into the collection of smaller specimens you see above. The remainder of the weekend (November 3rd, 4th) was spent covering streets and fields, with no luck. I met up with Brien Cook on Sunday, and he was kind enough to let us purchase the 42.9 gram windowed stone that is now Novato #2. It will be put on public display somewhere in Southern California in the near future. An additional weekend of hunting with Michelle turned up nothing but pleasant scenery and more wild mushrooms. On November 13th, I met up with Mill Valley teacher Julie Hanft and her brood of sixth graders from Greenwood school. We passed around some meteorite specimens, talked about some basic aspects of meteorite formation and fall mechanics, and covered some nearby open areas thoroughly with a semi-organized line. We didn’t find much except a jackrabbit and some more mushrooms, but it was a pleasant day spent in the rolling hills, and hopefully some of the students will find the time to hunt some more and maybe even turn something up. On Saturday, November 17th, Mrs. Webber and Dr. Jenniskens hosted a meteorite identification event at a local church, offering to identify possible meteorite finds/suspect rocks. A display of every available stone (Novato #s 2, 3, 4, 5, 6) from the fall was made possible by efforts of the finders/owners of each specimen. Novato #1 was not present, but not without good reason: it was en-route to Italy for gamma-ray emission counting. It was initially thought that a rock found earlier on Saturday by Greg Stanley, a meteorite hunter from Bakersfield, might be a meteorite, but the ~3 gram stone proved to be an unusually magnetic terrestrial pebble. It was revealed at the meeting that Novato #6 had been found a few days prior to the Saturday event. It consists of a single ~24 gram fusion-crusted fragment that was found in a local school’s parking lot, significantly to the South of where previous finds have been made. It was found by member(s) of the Kane family, local residents. Novato #s 2, 3, 4, 5, 6. Novato #6, a partly fusion-crusted fragment. The stone is composed almost entirely of shock-darkened material. Glenn Rivera (co-finder of Novato #1, and neighbor of Lisa Webber) examines the fusion crust of Novato #5 with a binocular microscope as other attendees look on. The view through the microscope — a close-up of the glassy fusion-crust on Novato #5. At the event, we loaned the largest fragment of Novato #5 to Dr. Peter Jenniskens of SETI/NASA for magnetization studies. Because the stone was so easily recognized in the field, I did not use a magnet to identify it, and had never poked it with a magnet, rare-earth or otherwise. This was the only stone recovered from the fall that was not identified with a magnet, making it the only possible stone for this type of study. The only other thing of note — Peter and Barbara noticed an odd…life-form…in the parking-lot of their motel on November 16th. It appears to be a lizard’s claw stinkhorn (Lysurus mokusin), a type of fungus/mushroom. In itself, that isn’t so noteworthy; while grotesque and not that common, these “mushrooms” aren’t considered rare. However one well-known reference book makes a point of stating that none has been observed North of Santa Barbara, and I was unable to find any reference elsewhere to specimens found farther North. Since this specimen was found just North of Novato, it expands the known habitat of this species by just over 300 miles. That’s quite a leap for a mushroom! We hunted the remainder of the weekend with no luck, and have since been out a few more times. Update: as of 1/2014, the meteorite has been approved! As of August 2014, the consortium’s paper has been published! Its release was accompanied by a few articles in the news. Here’s a CT-scan of N05 from the paper — pretty cool! I’ll continue to hunt in the area sporadically and will update this page if/when anything noteworthy comes to light.